A 7-year-old female came to clinic for health supervision. She was growing and developing appropriately. During the social history, the pediatrician asked if there were any guns in the home. The father answered that yes there were long guns used for target practice and occasional hunting. When she asked about safety measures such as trigger locks, gun cabinets, or keeping ammunition separated, the father said that the guns were in his closet along with the ammunition. The pediatrician recommended that the guns be taken out of the home, but also said that if the guns remained then they should be kept in a gun safe where they could be stored unlocked with a individual trigger lock on each gun. Also she recommended that the ammunition be stored in its own separately locked container. The father seemed partially annoyed but also partially puzzled and asked questions about why trigger locks were recommended. The pediatrician replied that this was an inexpensive way to make sure the gun wasn’t discharged by accident. “The trigger locks are about $10-15 each, and an ammunition safe or lock box starts around $60. It’s a lot less expensive than the cost of having a gun injury,” she replied. For anyone, general access to guns is one major reason fatalities and injuries. If a gun is not available then it simply cannot be used. In pediatric patients, younger children are simply curious about the world and will explore everything, including guns, that they find without any understanding of the danger. Older children developmentally are not able to discern the difference between the fantasy world of videogames, movies and television and may not understand that people truly are hurt or killed by guns. Somehow in the fantasy worlds, the hero or player always seems to be able to come back to life. Teens and young adults often do not have the judgment to not act impulsively. Fights, wayward emotions and a gun in the environment can bring about tragedy in an instant. Additionally there are homes where mental illness, substance abuse, and many other stressors can turn the availability of a gun into a disaster. With these pediatric developmental considerations in mind, the American Academy of Pediatrics’ policy on Firearm-Related Injuries Affecting the Pediatric Population states that “Firearm-related injuries are often fatal; primary prevention is essential.” It further states that “…the most effective measure to prevent suicide, homicide, and unintentional firearm-related injuries to children and adolescents is the absence of guns from homes and communities.” [emphasis added.] It additionally recommends that parents should be counseled regarding the presence and availability of firearms and to encourage parents to prevent access. Recognizing that the safest home is one without guns, parents should also be counseled about safe gun storage including ways to limit access such as gun cabinets or other locked storage containers, individual firearm trigger locks, and separate locked storage containers for ammunition. Additional concerns should be reinforced in homes where there are patients with “mood disorders, substance abuse problems (including alcohol), or a history of suicide attempts.” Individuals in these homes are at an increased suicide risk. Public health is “the science and practice of protecting and improving the health of a community, as by preventive medicine, health education, control of communicable diseases, application of sanitary measures, and monitoring of environmental hazards.” Public health measures have been effective in disease prevention, improving traffic fatalities, etc.. Public health measures have helped to decrease pediatric morbidity and mortality such as car safety restraints, medication packaging, drug development for cancers, implantable devices for hearts, vaccines for infectious diseases, etc. Unfortunately this is not true for firearms. In the United States the number of firearm fatalities has been increasing over the last decade with ~31,500 people per year. By 2015, firearm fatalities are expected to surpass motor vehicle fatalities overall. In the 0-24 year population, the only group that does not have homicide or suicide as one of the top 4 causes of death is in the under 1 year group. A 2009 study of violent deaths in the US found that firearms were involved in 51.8% of suicides and 66.5% of homicides. Firearms were the leading cause in both cases. Gun related fatalities are twice the number of cancer fatalities, 5 times the number of heart disease and 15 times the number of infectious diseases. In 2010, the number of firearm fatalities in children and young adults 0-24 years was 6,462. Whereas over the last 10 years, all the vaccine preventable diseases (incidence only not fatalities) was 3,948 when pertussis was excluded. To see a table of the top 10 causes of death by age group, click here. Gun violence is a public health problem that needs multimodal solutions. Health care providers need to continue to educate the general public to view gun violence as a public health measure so children and parents will understand how they can decrease their own risk. Engaging lawmakers and other community stakeholders in helping to make appropriate regulations and laws improve the health and safety of the general community. Public health methodologies are multimodal and have been successful. It is time to apply them in earnest to this growing public health danger. 1. What are the fatality rates for firearm violence in different countries? How does this stratify by war zone? 2. What are the local resources for firearm safety training? 3. What advocacy efforts are available in your local community to prevent firearm violence? Information prescriptions for patients can be found at MedlinePlus for these topics: Teen Violence and Gun Safety. The American Heritage® Stedman’s Medical Dictionary. Houghton Mifflin Company. Available from the Internet at http://dictionary.reference.com/browse/public+health?s=t (rev. 2002, cited 5/21/13). Christoff C, Kolet I. American Gun Deaths to Exceed Traffic Fatalities by 2015. Available from the Internet at http://www.bloomberg.com/news/2012-12-19/american-gun-deaths-to-exceed-traffic-fatalities-by-2015.html (rev. 12/19/2012, cited 5/21/2013). Karch DL, Logan J, McDaniel D, Parks S, Patel N; Centers for Disease Control and Prevention (CDC). Surveillance for violent deaths–National Violent Death Reporting System, 16 states, 2009. MMWR Surveill Summ. 2012 Sep 14;61(6):1-43. Dowd MD, Sege RD; Council on Injury, Violence, and Poison Prevention Executive Committee; American Academy of Pediatrics. Firearm-related injuries affecting the pediatric population. Pediatrics. 2012 Nov;130(5):e1416-23. World Health Organization. WHO vaccine-preventable diseases: monitoring system. 2012 global summary. Available from the Internet at http://apps.who.int/immunization_monitoring/globalsummary/incidences?c=USA (rev. 2012, cited 5/21/2013). Palfrey JS, Palfrey S. Preventing gun deaths in children. N Engl J Med. 2013 Jan 31;368(5):401-3. Centers for Disease Control. Fatal Injury Data. 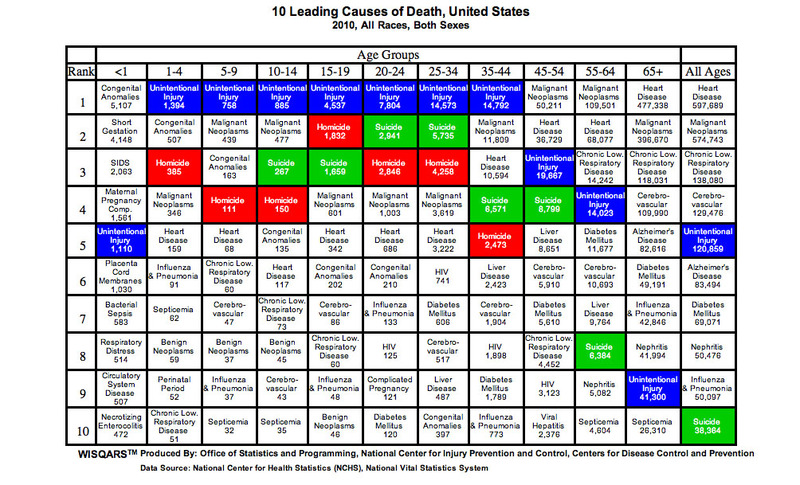 Available from the Internet at http://www.cdc.gov/injury/wisqars/leading_causes_death.html (rev 9/12/2012, cited 5/22/13).